Toronto Islamic arts centre breaks ground - 2010-05-28 | Ismaili.NET - Heritage F.I.E.L.D. The leader of the world's Ismaili Muslim community was in Toronto Friday to break ground on what is being billed as the largest Islamic art and culture centre in North America. The $300-million development slated for Wynford Drive near Don Mills Road will cover 6.8 hectares and will include a museum, an Ismaili cultural centre and a park. The Aga Khan, leader of the group of Shia Muslims known as Ismailis, said the Aga Khan Museum for Islamic Art and Culture is his gift to Toronto. "The museum's focus on the arts of Islam will make it a unique institution in North America, contributing to a better understanding of Islamic civilization, the plurality within Islam and Islam's relationship to other traditions," said the Aga Khan. Prime Minister Stephen Harper, who presented the spiritual leader with honorary Canadian citizenship, attended the ceremony. "I've been deeply moved by your gracious gesture," said the Aga Khan. "This is significant recognition of the values which our community of faith shares with the people of Canada." Jehad Aliweiwi, who runs a newcomer's settlement agency called Thorncliffe Neighbourhood Office, said since the terrorist attacks of Sept. 11, 2001, young Muslims have struggled with negative stereotypes about their religion and identity. "I think this will present them with a spatial and physical institution that they can look up to," said Aliweiwi. "They can feel proud of and say, 'Yeah, we do have a legacy of architectural marvel and painting'." Aliweiwi said the Aga Khan's appearance inspires dedication and community engagement in the Ismaili community. "The machine of volunteers that the Islamic community manages to put together to organize something like this, it is equal in terms of being impressive to the preparations going into the G8 and G20 [summits in the Toronto area]," said Aliweiwi. Tazim Hirji, a member the city's Ismaili community, said the new centre fills her with pride. "It's exciting because it's right off the DVP [Don Valley Parkway], and you can see it as you're coming down," said Hirji. "It's such a pride to see that." Afia Parveen said the new centre will help teach her daughter about Islamic history. "I went to the ROM, but there [is nothing] I can show my kids [about] Islamic history," said Parveen. The centrepiece of the development will be the Aga Khan Museum, designed by award-winning Japanese architect Fumihiko Maki. According to the Aga Khan Foundation, the museum will house and exhibit "some of the most important works of Islamic art in the world." Around 200 pieces from the museum's collection of more than 1,000 objects will be on display in a permanent gallery. The artifacts date back 1,000 years. Temporary exhibitions will also take place in addition to an extensive educational program that makes use of a multimedia centre and reference library. The museum will host workshops and classes for the public. A 350-seat auditorium will feature musical performances, book readings, films, conferences and theatre productions. 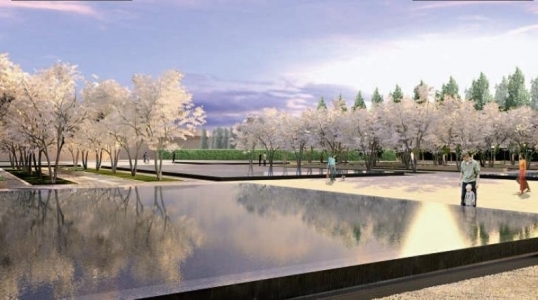 The landscaped park will incorporate a formal garden, reflecting pools and walkways. The development is to be completed in 2013.